NEW YORK (CNNMoney) -- What recession? 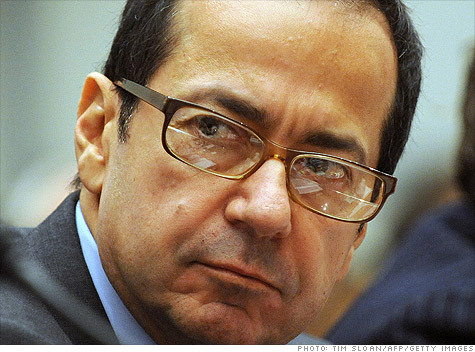 Hedge fund honcho John Paulson profited more than $5 billion in 2010, possibly the largest haul in investing history, according to a news report. This means that Paulson was making $158.55 per second last year. In 2010, more than $4 billion of his profits came from fund investments. Most of his funds contained bets on gold, due to Paulson's wariness of the dollar's long-term weakness, based on the Wall Street Journal's report. He placed much of his own money in gold-focused funds, which rose as much as 45% because of gold's meteoric rise last year. Paulson's take from last year exceeds the $4 billion that he raked in from short bets against subprime mortgages in 2007, according to the news report. The founder and president of investment firm Paulson & Co. achieved fame and notoriety, for betting against subprime mortgages on the eve of the market crash in 2007. His funds scored gains of as much as 590% from this subprime wager, the news report states. Other elite hedge fund profiteers in 2010: David Tepper, founder of Appaloosa Management; Ray Dalio, founder of Bridgewater Associates; and James Simons, founder of Renaissance Technologies. Each made between $2 billion and $3 billion last year, reported the newspaper. What's so great about working at Goldman?